Aloe vera is a plant with healing properties that can do wonders for your face and skin. Aloe vera gel is a popular ingredient in many skin lotions, face masks and cosmetics for its medicinal and moisturizing properties. You can also use aloe vera gel directly on your skin and face to treat sunburns, help wounds heal quicker, treat skin irritations and reduce inflammation. The reason that aloe vera gel is so good for your face and skin is that it contains a wealth of nutrients. Gel from the leaf of the aloe vera plant contains vitamins, minerals, active enzymes, and amino acids. You can also add to aloe vera gel ingredients like tea tree oil, witch hazel, coconut oil, or essential oils to help treat a number of skin conditions naturally. In this article, you will find out what scientific research has revealed as to the healing properties of aloe vera gel. You will also find practical ways on how to use aloe vera gel on your face and skin everyday. You can get the health benefits from aloe vera gel by applying it topically to your skin or by consuming aloe vera juice. Why is applying aloe vera gel every day to your skin or face so beneficial? Let’s look in more detail at scientific research showing the daily benefits of aloe vera for your skin. You can apply aloe vera gel on your skin to help accelerate wound healing. Learn more about how to care for wounds naturally to help get rid of scabs faster. Aloe vera is a great natural remedy for sunburn because it soothes and heals inflamed, damaged skin. Find out the best way to get rid of sunburn and prevent blisters from causing discomfort. You can apply aloe vera gel to your skin everyday because it has a high moisture content which helps to hydrate the skin. You can also make your own natural moisturizers to treat dry skin around your eyes. Applying aloe vera gel or cream on your face daily may improve the appearance of fine lines and under eye wrinkles. Aloe vera naturally improves the skin’s elasticity and stimulates collagen production. Learn what foods you should eat to protect against wrinkles and help delay the signs of premature aging on your face. Aloe vera’s skin care properties mean that you can also use the gel to treat chronic dermatological conditions like eczema and psoriasis. Both eczema and psoriasis are characterized by patches of itchy red skin that can become inflamed and flaky. Aloe vera is just one of the many home remedies to help treat eczema and other inflammatory skin conditions including skin rashes. Another reason for using aloe vera gel on your face and skin is that it can assist in treating acne. However, you can also use aloe vera with other ingredients to help get rid of acne. For example, tea tree oil and witch hazel together with aloe vera gel can help fight off pimples. At the end of the article, you can find out how to make an anti-acne ointment using aloe vera. You can also try some of these effective DIY face masks for acne. Use aloe vera gel or lotion on your skin every day to help get rid of stretch marks and reduce the appearance of scars. Stretch marks can appear on the stomach after pregnancy or rapid weight loss. The ability of aloe vera to improve the skin’s elasticity helps to remove unsightly stretch marks. If you have stretch marks on your belly, learn about other ways to lessen the appearance of these marks. Aloe vera gel contains compounds that help to lighten skin and give your face a more even tone. Dark spots or liver spots can appear on the skin because of sun damage or aging. Liver spots commonly appear on the face and the back of your hands. Regularly applying aloe vera gel to your face or skin can help to treat these dark blemishes. There are other natural ways to even the tone of your skin and reduce sunspots. There are many ways that you can use aloe vera gel, lotion, or cream on your skin and face. 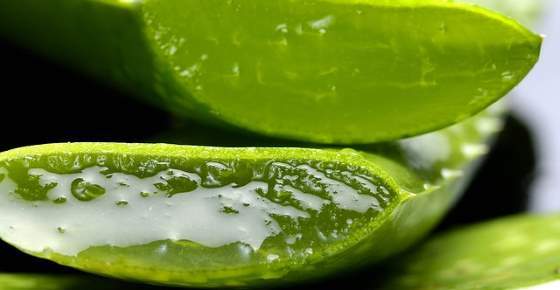 You can use aloe vera gel straight from the leaf by breaking off a leaf and squeezing out a small amount. However, you may find it easier to buy aloe vera gel from your local health store or online. When looking for the best aloe vera gel, it is important to look for it in its purest form. Aloe vera can spoil quickly and so some preservatives are usually added to keep it fresh. Try to purchase organic aloe vera gel that contains as much as 99% bio-active aloe vera or 100% aloe vera – here is one example. You can use aloe vera gel to lessen the appearance of fine lines and wrinkles by adding some essential oils. Many essential oils like lemon essential oil, clary sage, frankincense, and lavender have antioxidant properties. This means that they help to destroy free radicals from your skin which are associated with signs of premature aging. For example, studies have shown that lemon essential oil can protect the skin from oxidative damage. (19) This can help prevent fine lines getting deeper and developing into wrinkles. You can find many other essential oils to combat wrinkles in my previous article. Take 30 ml (1 oz.) of aloe vera gel and add 4 drops of lemon oil, 4 drops of sandalwood oil, and 4 drops of lavender oil. Cleanse your face with your usual facial cleanser. Apply the aloe vera anti-wrinkle remedy daily to your face and back of your hands to help improve the appearance of your skin. Leave the aloe vera gel on without washing off. You can create your own aloe vera gel treatment to help get rid of pimples and other signs of acne. This home remedy uses aloe vera for its anti-inflammatory properties, witch hazel for its astringent effect, and tea tree oil to kill off acne-causing bacteria. Mix 6 tablespoons of witch hazel and 2 tablespoons of aloe vera together. Add 5 drops of tea tree oil and 5 drops of lavender oil and mix well. Use a cotton ball to apply the aloe vera lotion to your acne prone skin to cleanse it and remove impurities. Use the aloe vera remedy morning and night for best results. Tea tree and lavender oils are some of the best essential oils for acne. You can make a rich aloe vera moisturizing cream by adding coconut oil. The benefit of this aloe vera cream is that coconut oil has antimicrobial properties and can help to treat dermatitis. Put 1/2 cup of solid organic virgin coconut oil and 1/3 cup aloe vera gel in a bowl and whisk with an electric whisk. (Should take between 5 and 10 minutes). Don’t melt the coconut oil as it will only whip up if it’s solid. Add a few drops of tea tree oil while whisking. Put the aloe vera coconut oil cream into a glass container and store in the refrigerator if your house is warm enough to cause the oil to melt. (You want to keep its whipped consistency). Apply 2 times a day to patches of dry skin to help hydrate your skin and prevent your skin from cracking. The active healing compounds in aloe vera mean that aloe vera gel is a great treatment to heal wounds or soothe skin abrasions. Aloe vera is so effective in helping repair damaged skin that you just have to apply pure aloe vera gel to the affected area. Apply aloe vera gel or lotion 3 or 4 times a day to help your wounds heal faster. The anti-inflammatory soothing properties of aloe vera mean that aloe vera lotion is an excellent choice for after sun skin care. Mix 1 tablespoon aloe vera gel, 1 tablespoon honey, and 1 tablespoon plain yogurt. Optional: Add a few drops of peppermint oil to the mixture to help cool your skin. Apply to the sunburned skin and leave for 20 minutes to help reduce inflammation and heal your damaged skin. Rinse off with cool water and gently pat dry. i use aloe vera juice with almond oil and a few drops of just swiss neroli, lavender, and geranium oil. my face is so soft and has noblemishes at all. I would consult with your doctor before taking any supplement. very useful information…….but I was using aloe vera for sorbereah dermatitis which affected my hair scalp and face skin very badly but it didnt worked so effectively and I had to seek allopathic treatment. Does aloe Vera help to treat rocacea? My face is always red? What to do? Hi Arshia, please refer to my article “The Best Natural Remedies for Rosacea“. Massage the gel on the affected area and let set and soak. Don’t wash the gel off, your skin will absorb it completely. Repeat 2-3 times a day. You can also mix the aloe vera with vitamin E oil and rub the mixture on the skin. Buy pure aloe vera gel and rub it on the acne affected part of the skin. Repeat the process twice a day for at least one week to get rid of the acne. For added benefits, you can mix the aloe vera with tea tree oil or witch hazel. I have dark spots on my face can I use avera. Please let me know howto use it. Hi Roxana, simply rub a little bit of aloe vera gel onto the dark spots and leave to soak in. As aloe vera is very gentle, there is no need to rinse it off, but you may want to rinse it off if it starts to feel sticky. You can apply it just before going to bed. It might take you a while until you see results as dark spots can be quite persistent. You can also find more suggestions for hyper-pigmentation here. When my grandchildren were babies we used Aloe Vera for sore gums & nappy rash. Brilliant all-rounder. Is that possible to grow in paris? You can grow it indoors – see more information here. My husband has a rash on his shin that is getting worse as the years go by, Doctors have all given mixed responses as to what it is, most tend toward eczema. He has tried numerous products to treat with no lasting relief. At a recent doctors visit it was suggested he treat it using aloe w/vitamin e. We have not been able to find such combination in a lotion/gel to rub on the area. So I’m looking at buying aloe vera gel and vitamin e and mixing them myself. The problem is knowing what the ratios should be. Any ideas? Thanks! Hi Nancee, usually for face mask the ratio is something like 1 tbsp. of aloe vera and about 2-3 vitamin E capsules. Often the amount of aloe vera in these commercial products is very low, and you can check it if you read the product label. If you want to try aloe vera, buy pure aloe vera gel and read the product label to make sure it’s alcohol free and has the least amount of ingredients in it and the highest percentage of aloe vera. You can also make at home the coconut oil and aloe vera gel lotion. Another option is to try this turmeric face mask or witch hazel. If you see no improvement, it will be a good idea to consult with a doctor/dermatologist to find the underlying root of the problem. Thanks for all these beneficial info. However, i bought a big jar of Aloe vera recently and I found out that it contain carageena which I found not to be suitable for consumption. Have any say on this please, and can it be used topically instead? You probably refer to Carrageenans that are food additive extracted from a red seaweed and are widely used in the food industry for their gelling, thickening, and stabilizing properties. It is recommended to avoid regular consumption of foods containing carrageenan as some research has linked some forms of carrageenan to cancer and inflammation processes in the body. In this article, the use of aloe vera gel is externally only by applying it to the skin. I’m not sure if you refer to aloe vera juice or gel, but in any case I personally would not apply it even on the skin. You need to try and find aloe vera gel that contains the maximum amount of aloe vera (usually it’s 97-98%) and the least amounts of additives. Since aloe vera is very perishable, commercial products usually include some preservatives, but you need to read the product label carefully to see what’s in there. How to use for psoriasis .should apply on body or drink as juice? Can just buy the gel (99% original gel) from the healt store or should I buy the plant ? You can use either the plant, or if more convenient you can buy aloe vera gel from health store. When you buy the gel from the store, always read the product label to make sure you buy the highest percentage of aloe vera gel and the least amount of additives. Fresh aloe vera has a short shelf life so if buying commercial aloe vera gel, they use preservatives to extend shelf life. Is sempre vivorum also useful as Aloe Vera for skin treatment? I’m not familiar with this – sorry. Hi where can l get aloe Vera? You can get it from pharmacies, health stores, or online.